Met with my trainer today for another circuit workout. Wow. I feel like these sessions are somehow getting more challenging yet easier to accomplish. That may not even make sense and I’m not sure if I even understand it. Today we did a workout with just one kettle bell. That’s it. One tiny little piece of equipment + one awesome personal trainer = one heck of a workout. The thing I learned about the kettlebell is that it is incredibly versatile. Did a couple variations on swings, crunches, and my personal favorite (NOT) rows followed by hip raises (ouch). Powered through it like a champ. I thought we were using a 10lb kettlebell until I looked at my journal just now. The thing was 20lbs! Yay, go me! I truly feel that these sessions are improving my fitness and are a nice compliment to the lifting and running. And they’re fun. Well, at least now looking back at it I can say it was fun. Toward the end of the last circuit I can tell you I would have had something else to say about it. 🙂 Maybe I should rename the post to “Kettlebell Superhappyfuntime” but it just doesn’t have the same ring to it. Now to round out the week with one more 5 mile run! In other news I’ve registered for 2 more races since I thought about cutting back. I may need to seek professional help. Racing: How much is too much? Only a month into winter and registrations for the spring race season are opening left and right. I ran over 20 races in 2014 and it was one of the best years of my life. I love racing! The past two years I’ve taken the summers off of my grad studies to train, race and recover to my heart’s content. The thing is I’m also trying to finish a doctoral degree and the way the stars align, I can’t take this summer off of school. Bummer right? I told myself I was going to seriously cut back on racing this year and only do 2 half marathons in preparation for the full marathon in October. That’s it. And then the crazy sets in…Okay, maybe one 5k with my son because he’s really interested in it. And this 17 mile trail race looks really cool. And It might be fun to travel for a race or two and see another city. I haven’t done any races at all since October. I’m really itching to get out there. Maybe next month, is there a race next month? Just one? So far here is what I’m registered for. I feel like a little kid who was told “just 2 cookies” only to be found 15 minutes later in the cookie jar up to my elbows, face covered in chocolate. And no, you’ll notice the actual marathon isn’t on that list. The registration doesn’t open for that until next week. And it’s a lottery (don’t worry I have a backup 26.2 if I don’t get in). The 2nd half marathon for training isn’t on that list either. Oops. Or the 5k I want to race with my 6 year old. Oops again. So, it looks like… I’m an addict. Not sure what to do about it. I see a race online and immediately start checking the calendar (can’t overlap with hockey!) and digging in my purse for my credit card. I don’t care about the stuff, the swag, the medal. I don’t care about the entertainment or the beer. It all honestly doesn’t even matter. If it’s a race within a 2 hour drive of my house, I want in. I don’t know if there’s a cure for this but I am going to have to figure something out. Or learn how to write a dissertation while jogging and chugging power aid. Wow. Wow wow wow. 37 degrees, in Minnesota, in JANUARY! The weather today was the very best present I could have asked for. And it truly felt like a gift to be given a spring day in the middle of winter. I went for a fabulous run with a good friend and let me tell you, the experience was just phenomenal. 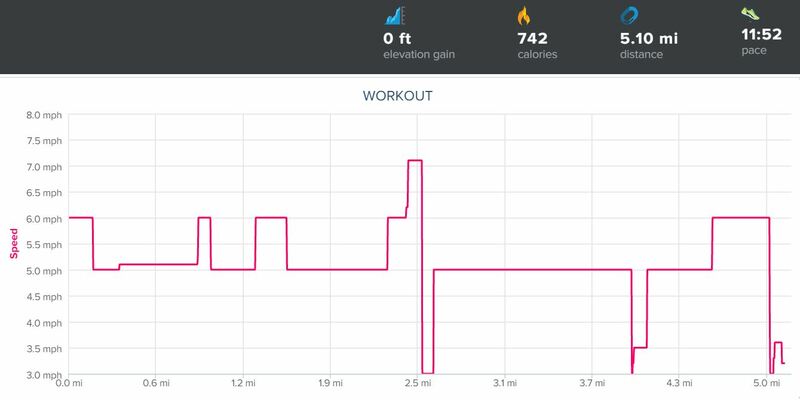 I invested in a nice treadmill with some really cool features a couple months ago and it’s been great and super convenient. But let me tell you, nothing compares to that fresh air, wind in your hair, sunshine on your back feeling of a good run in nice weather. My pace wasn’t great. I didn’t achieve any personal records. I didn’t run any huge distance. But I ran. I ran outside and I had fun. It was a great day. Got my groove back this week! I’ll admit, last week was rough. Not every week will be spot on or perfect. What’s important is recovering and jumping back in to keep the momentum going. That grad paper I put a million hours into last week? Got it back today – 100%! Making progress on the new projects at the office. Husband was out of town the past few days so it was just the kids and I. No hockey practice the past couple nights (weird) but we’ve been spending time on their homework and piano practicing. My grad work for this week is about halfway done which is a comfortable place for me on a Thursday. I was able to get an earlier start to it this week which has made all the difference. …your macros. I want to take a minute to talk about nutrition. All of this training I’m trying to cram into my nutty schedule won’t do anything to change my body if my nutrition is working against me. My sister in law turned me on to the If-It-Fits-Your-Macros (IIFYM) diet this past Spring and let me tell you it has been a game changer. IIFYM is basically an eating style that allows you to eat some processed or traditionally “unhealthy” food in moderation as long as it fits within your macronutrients goals. That is my really basic explanation of it although there is lots of information out there on the subject. IIFYM.com is a great resource with calculators and the science behind it. IIFYM sometimes gets a bad rap because it doesn’t put any foods on a ‘bad’ list or restrict them. That said, things I eat do have to fit my goals for protein, fats and carbohydrates at the end of the day. For example, I know I can’t eat a bucket of fried chicken because it wouldn’t fit within my goals. But if I want a cookie after my grilled chicken and steamed veg dinner? It’s fine and I don’t have to feel guilty about it. And I LOVE that about eating this way. If I want gummy bears (as I often do!) I have them and I don’t cry about it. I still work toward eating as many fruits, vegetables, lean protein and whole grains for most of my nutrition. Yesterday I did not have produce available to me and was constantly on the go from thing to thing. 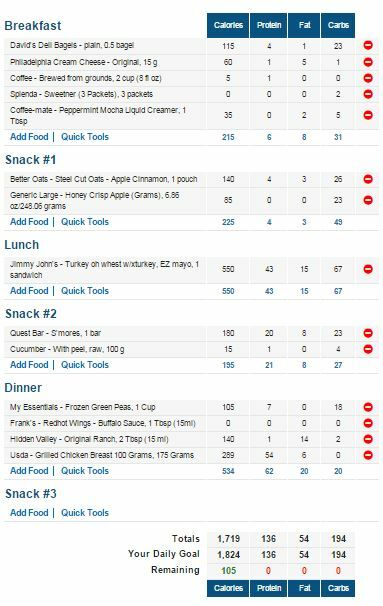 I wound up eating almost exclusively convenience foods and somehow still hit my macros. Hit the macros but felt like garbage. I didn’t feel guilty or terrible mentally but I just didn’t feel as good physically. Today I met about the same macros but included more (not all!) whole foods and produce and felt much better. It’s all about what you do with what you have. 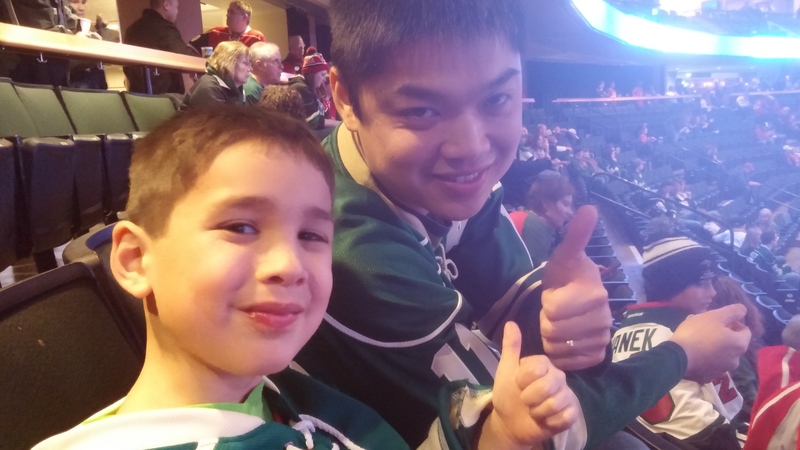 We had such a great time taking the boys to the see the Minnesota Wild play at the Xcel Energy center last night. We got to St. Paul around 5:30 PM for the 7:00 game. Our 6 year old had a little too much smoothie from Caribou on our way so we spent a frantic first five minutes looking for a bathroom. Once we found one, let me tell you I’ve never seen that kid run so fast! It turns out the Xcel doesn’t open their doors for the game until 5:45 so we waited to get in for a few minutes. Once we were in the boys immediately wanted to go see the ice. One of the security guards noticed how excited the kids were and asked if it was their first NHL game. We of course said yes and he told that we take them to guest services for a free puck to mark the occasion. How cool! Virtually no line at guest services and they were so nice. We spent the rest of the game walking around, eating game food (“trickle fries”, fried pickles were awesome!) and taking pictures with the mascot, Nordy. We purchased tickets for this particular game through the boys’ youth hockey association so there were lots of kids they knew in our section. The boys had a blast chatting and cheering with their friends and team mates all night. 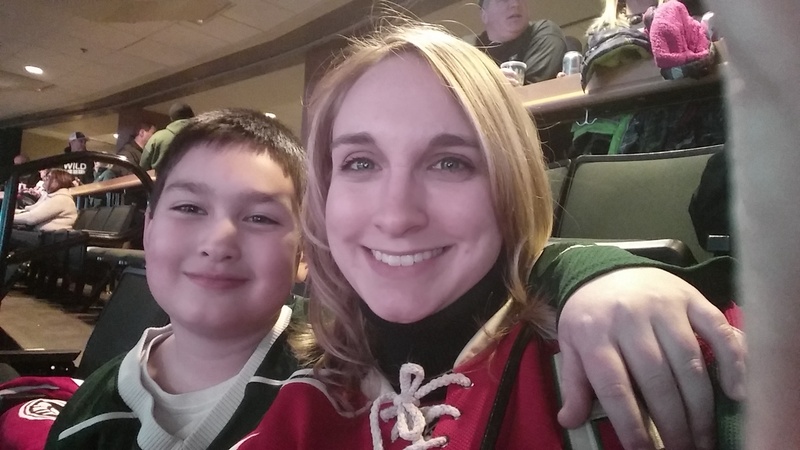 I only wish the Wild would have scored more! 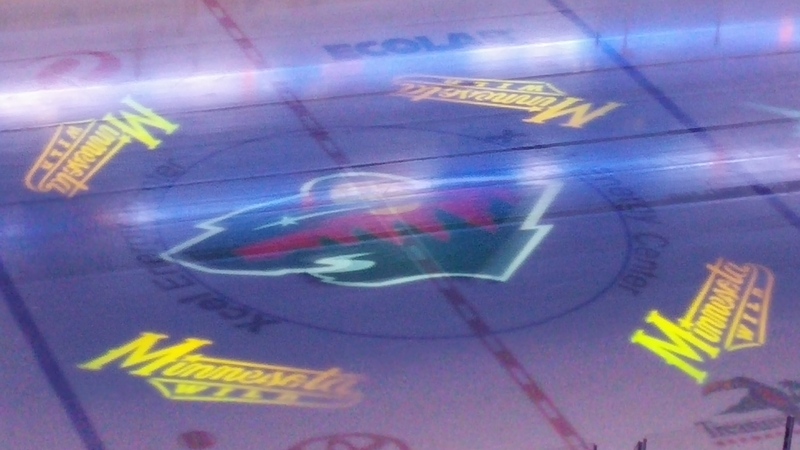 The Wild lost to the Columbus Blue Jackets 3-1. Oh well. 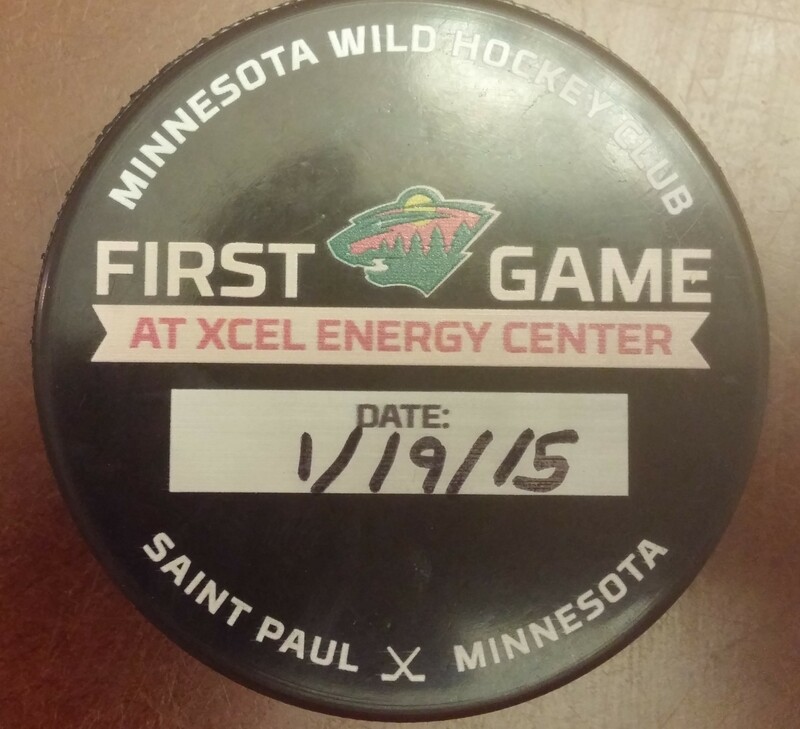 Something tells me there will be more Wild games in our future.